The first flavors that come on is a meaty, saucy, steak sauce, along with a touch of garlic and hints of black pepper. The chewing brings in more of the natural meat flavors, something cooked well-done. The worcestershire becomes more defined after several chews, along with the black pepper. In comparison to the brand's healthful claims of using only grass-fed beef, with no preservatives and MSG, this jerky does give off a more natural flavor, chewing, and feel. It doesn't have the plasticky, gummy chewing that national brands have, and it does deliver a prominent, natural meat flavor. Otherwise, the primary taste profile is a saucy blend of steak sauce and worcestershire poured over a seasoned grilled steak cooked well-done. The vinegar in the worcestershire is lightly noticeable and tastes as if it was its own ingredient. It's black pepper is well-noticeable but not spicy, the salt is kept low, while a sprinkle of garlic lingers in the background. The meat consistency seems OK. I did encounter a fair amount of hard tissues, perhaps gristle or tendon, that collected up into unchewable wads. 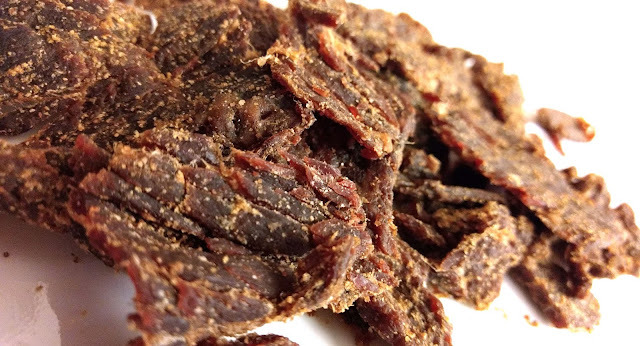 It's a dry jerky with a meaty feel, but chews down to a softened texture like it had been tenderized with bromelain or papain. I'm not saying that's the case, it just mimics that feel. This Wicked Original from Boston Jerky Co. is a sauce-forward style of chew blending together popular marinades into something savory and tangy. It very much resembles the flavor of a seasoned, marinated steak, cooked well, but carved up into thin, easily chewable slices. The worcestershire is tangy through a vinegar-weighted character that interacts with the garlic and black pepper to create a touch of coriander seed. The sweetness remains faint and the saltiness light. The chewing is dry, yet still meaty, though lightly mushy once chewed down soft. Pieces of unchewable tissues seemed few too many. 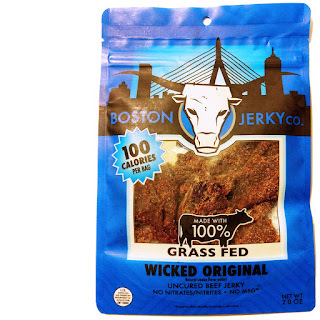 Flavorwise, however, this Boston-born jerky belts out a bold, steaky experience that'll charge up a frosty football fan on the frigid seats of Foxborough. Had this jerky been around 250 years ago, I'm sure the mother country would have taxed this too.